Bruce, Thank you. I'm glad you enjoyed the visit. Trees 1&2 are pines. Sugar Pines I think. I can't see the bark well enough to tell (see next picture) I'm pretty sure the tree to the left of tree "1" in a young Ponderosa Pine. Tress 3&5 are Giant Sequoia of course and tree 4 an example of a Incense Cedar. by the way. In modelling trees, I think the very best we can do will still be an extreme characterization when compared to nature. IMHO the best we can do is to simulate the bark difference and color, the branch layering and density. I think it would "pay off" to put extra work in a few foreground tress while letting the others fade into a generic forest. Your comments wanted please. Imagine the track painted and the ground throws painted to blend in. How does it look as compared to other better Model layouts? I'm bothered by the size of the two HO Ground Throws that control the 3-way switches. I could move them to a remote with a under-the-table machine but I would still have the two N-scale ground throws. Would moving the two HO Ground Throws really make a difference? What strikes me (and it's something I've thought about in my own yard) is whether you'd need to reach over a car to throw a turnout. That would be A Bad Thing. From the guy who even hasn't any stub switches. Please don't hit me but I think the looks would much improve if you placed the ground throws at the layout rim. The stubs looks really great but the overall looks is marred a little by the giant ground throws. So if possible move them all to the rim. But yes I think moving just the HO one would much improve things. Would it be possible to arrange wire rod throws under the layout with a nobs maneuvering them with at the layout rim? I really like that track Bob! I'm with H�kan, any chance of moving the ground throws? d want to be sure they had a good detent, however, so they'd stay in position on your three-way switches. Fairly simple to make the under-baseboard controls for switches. 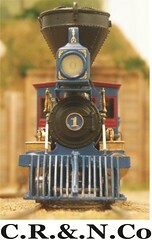 There's and article in Model Railroad Hobbyist (free online) Feb. 2011, which shows how to make a control using a rotary switch to control raqther than pushing and pulling a know. Pretty slick and you can use it to show switch position on a fascia panel. Thank you ALL. I'm honestly grateful for your honest reply's. Again Thank you. Engineering is underway for an under table controller. Dave. You have a good point there. I've always used ground throws on my previous layout when the turnout was in easy reach. I really like having the "hands on" but, It didn't take too long of data base searching to recall the brake wheels, chimneys and other little details that suffered from my reaching in. In this yard, I'm left handed and the approach will be from "over the water" but still that's a point I must consider on the smaller ground throws. H�kan, I hope you enjoyed my trees 101 and frank words might sting but I do recognize their value. After all, I want to obtain excellence as much as possible. Skip, The MRH article was GREAT. Thank you. A smart man would wait until he knew his invention works before unveiling it to the world...but that's not me. So I first look at what was available commercially. I found two MFGs who made switch machines for manual throwing. I did like them because they required you to cut a slot under the turnout, something I didn't like the thought off. Ruling them out, I started planing my own. I started with what others had done and checked out was available to those poor demented souls who build R/C aircraft. The basic design came rather quickly but presented a problem. As two radius arm turn they move father apart. Maybe I shouldn't say this publicly but the solution came to me in a dream as I slept. Move the smaller circle inside the larger would reduce the problem. Here some pictures. I played with it a while like this then added some 1/16 brass tubing to the bell crank and the shaft supporting the linkage line. I also replaced the brass linkage line with a steel one. These changes improved performance. Here's what the switch machine looks like now, ready to instal. Yeah, Bob - that looks really good -- I am still working on those for my layout (just beginning) so I'll be closely following your progress. At least my turnouts are only two-way which makes it a bit easier. Your dreams are more productive than most of mine! Innovative solutions always excite me. Looking forward to seeing your final result. My switch controller does NOT work . It controls the electrical switches just fine but there is too much spring action in the S-shaped linkage wire to operate the track switch. I started with .030 steel and stopped with 1/16 steel wire. Nothing worked. My 3-way needs almost 3/16 inch of travel. I found that the under table side of the .030 S-linkage needed to travel about 160 degrees to do that. So I'm back to square one on this one. Oh Well, Nothing worth while is easy. Darn. I was kind of afraid of that, since you are actually bending the rail. .... Well, back to the drawing board. Is the problem just the strength of the parts of the linkage? I wonder if some kind of manual worm drive might provide the power needed. I also found some other stuff in Google search where folks were using servos. I am surprised that they would be powerful enough. crank a car out of a ditch! LOL!